Lido 14s at Fern Ridge for … changing of guard? EUGENE, Ore.---The first 50 years of Lido 14 Class Championships have been dominated by dynasties: Dave Ullman nine times a winner from 1969 to '86, Craig Leweck five times from '89 to '95, Mark Gaudio three straight from 2001 to '03 and again in 2007, following a triple play by Stu Robertson from 2004 to '06, far removed from his first win in 1975. The last winner not named Gaudio or Robertson was Nick Scandone in 2000 and he, now stricken with ALS, has gone on to represent the United States sailing a Skud-18 in next month's' Paralympics in China. 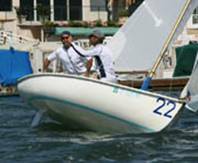 Will it be time for another changing of the guard when 40 or more boats from border to border and as far east as Ohio line up on Fern Ridge Lake Aug. 18-20 in the 51st Lido champs, organized by the Eugene Yacht Club? Tom Jenkins: time for a change? Newport Beach last year but whose free time this summer has been dedicated to coaching kids. He said this week that he wasn't planning to compete. A Brett Favre moment? We’ll see. 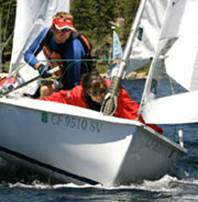 Most recently, Jenkins outsailed Robertson in three races, 1-1-3 to 4-6-1, to win the class in the annual High Sierra Regatta at Huntington Lake, and just last week he crewed on Eric Kownacki's Santana 20 as they won that class championship on the same waters of Fern Ridge, a few miles west of Eugene. "It's an interesting place," Jenkins said. "I don't know if you can know that lake well. There were some people who had been sailing there for twentysome years that struggled last week. We were the most consistent." Jenkins, 34, spots Robertson about "twentysome" years of experience in the Lido. "Stu's really tough to sail against," Jenkins said. "He's fast all the time, and so is Kurt Wiese. I sure love to sail against them. We've always been competitive … and it would be good for the class for someone else to win, too, to mix the fleet up a little." Robertson won in 2004, the last time Fern Ridge was on the class's rotating schedule. "It's going to be a tricky place to sail," Jenkins said. "In the Santana 20s, the first leg of the first race we probably had 40 to 40-degree shifts rolling through the fleet. "Every time we've sailed up there the locals always say 'these are not our normal conditions.' I've seen everything from 2-4 knots to 20-plus knots. And when the wind comes out of the east they don't sail. It doesn't ever fill in." The schedule calls for a couple of practice races on Sunday, Aug. 17; qualifying races Monday to divide the fleet into Gold and Silver divisions, and eight championship races over Tuesday and Wednesday. The Eugene YC will host a "Northwest luau" at its clubhouse on the lake Monday night. Local Sea Scouts will prepare breakfast for the competitors Monday through Wednesday.